The Sansui SKJ24FH07F 24-Inch Full HD LED TV is a high definition television which is perfect for your family. It is a perfect fusion of affordability, style, and technology. Firstly, it will add style to your living room or bedroom with its design. Next, the HD definition will provide a great viewing experience for you. The Sansui SKJ24FH07F 24 Inches Full HD LED TV comes with a flat surface which defines modern and minimal. It is sleek and compact as well. It weighs about 4KG, making it a cake walk to place it anywhere you want to. The approximate dimensions of this TV are 650 x 170 , 401mm (WxDxH). Viewing angle is 160 degrees which is wide so that all the viewers get a good view. The 24-inch display provides crystal clear view and amazing colour output. 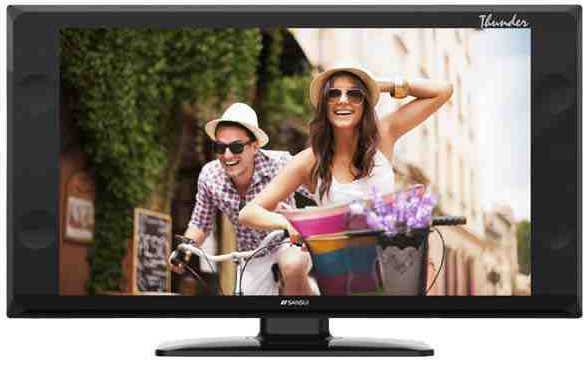 The Sansui SKJ24FH07F 24-Inch Full HD LED TV is driven by LED technology. The screen resolution is 1920x1080 pixels. Buckle up for a breathtaking audio and video output as the TV has inbuilt Audio and video technology. Whether you wish to enjoy games or movies, the view will be HD. The Sansui SKJ24FH07F 24-inch Full HD LED TV comes with more than 16 million colour dots and a high contrast ratio. This results in outstanding sharpness and clarity. There are two built-in speakers and a graphic stabilizer. For connectivity, there are HDMI and USB ports so you can connect your pen drive and laptops. It also comes with a 1 year warranty. The Sansui SKJ24FH07Fk 24 Inch Full HD LED TV comes for a price of INR 14890. Sansui SKJ24FH07Fk 24 Inch Full HD LED TV full specs and reviews as of Apr 2019. Buy it here!